Our fabulous sponsors – we couldn’t do it without you! 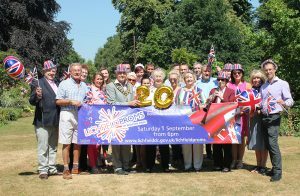 The sponsors of this year’s Lichfield Proms congregated at Beacon Park on 11 July to officially launch the end of summer event. 2018’s Lichfield Proms is on Saturday 1 September, when thousands of people will gather in Beacon Park for a spectacular evening of entertainment. Set to feature The British Police Symphony Orchestra, the City of Lichfield Concert Band, children’s entertainment and a fireworks finale, it is the night to end the summer in style. The free entry proms for the whole family is now in its twentieth year, so audience members can expect some special treats this time round. Lichfield District Council organises the free outdoor concert every year, and is keen to thank all its sponsors and supporters for their contribution. 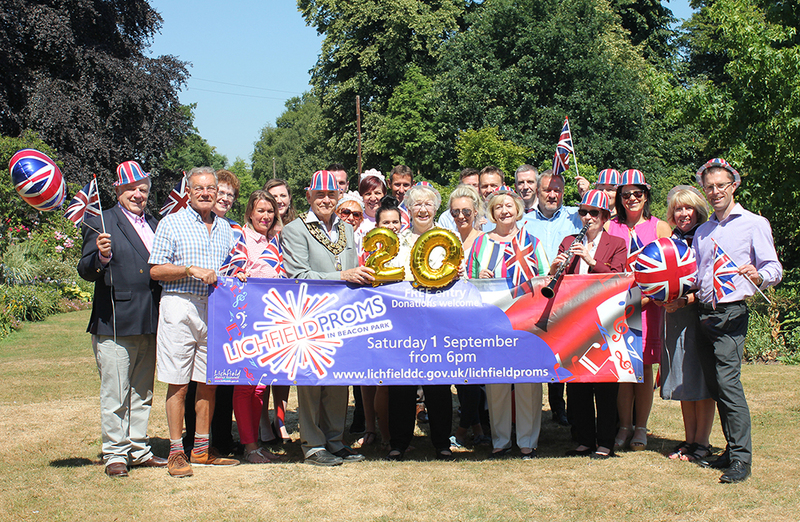 Councillor David Leytham, Lichfield District Council’s Cabinet Member for Leisure, said: “We’re all really looking forward to celebrating 20 years of Lichfield Proms on 1 September. It is one of the highlights of the events calendar, and is a chance to come together as a community and share in an evening of quality music and merry making. 2018’s Lichfield Proms sponsors are: BHB Architects, Strongs Plastic Products Ltd, Friel Homes, Vantage Motor Group, Wilcox Refinishers, Prizm Solutions, Allen Brown Jewellery, Lichfield Chamber of Trade and Commerce, Beacon Street Garage, The Best of Lichfield, The Arthur Terry Learning Partnership, Keelys Solicitors, Movecorp, Blue Print Designs, Moseleys Solicitors, Secret Garden and the Staffordshire County Councillors Janet Eagland, Colin Greatorex, Natasha Pullen and David Smith through the Staffordshire Local Community Fund. Lichfield City Council is also supporting Lichfield Proms through grant funding.